EDB to EML Converter allows performing batch conversion of emails from multiple EDB mailboxes into EML format. It is possible to convert the emails of each mailbox in an EDB file into EML files. The software will save each email in EML format with their respective subject line. After scanning and loading the EDB file, the software scans all the mailboxes present in it. You can view all the folders in each mailbox like Inbox, Outbox, Sent Items, Deleted Items Drafts, Junk E-mail, RSS Feeds etc. Also, the tool will show complete properties of each item like: to, from, sent date, received date, Cc, Bcc, contact name, email address, etc. 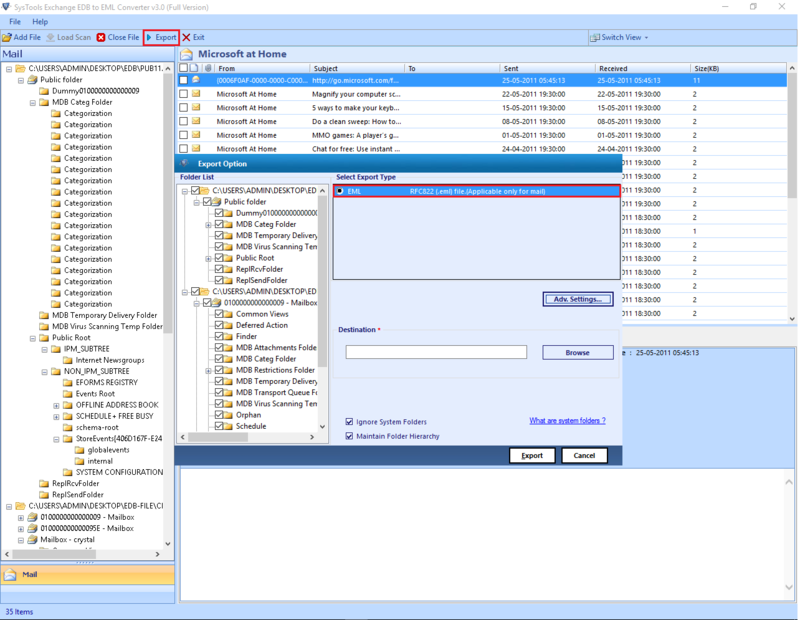 Search Selected Drive: This feature enables user to find EDB Files within the selected drives in your local system. This features within the Advanced settings Features allows a user to apply the naming convention to filter emails as per the naming of the files. The available options are : Subject, DD-MM-YYY, YY-MM-DD, Date(DD-MM-YYYY)+From+Subject, Auto Increment etc. As you start exporting EDB to EML, the software will generate a complete report in three different tabs. Each tab will show you a respective status each; Source File Name, Success Count and Fail Count. In these three tabs, you can view the name of mailboxes with a number of items being converted into EML file. EDB to EML Converter provides In-Built well-defined features that allow users to filter emails within specified Range of Date. Also, it provides facility to apply filter within certain Span of Time which can provide users with detailed information within narrow Scope. 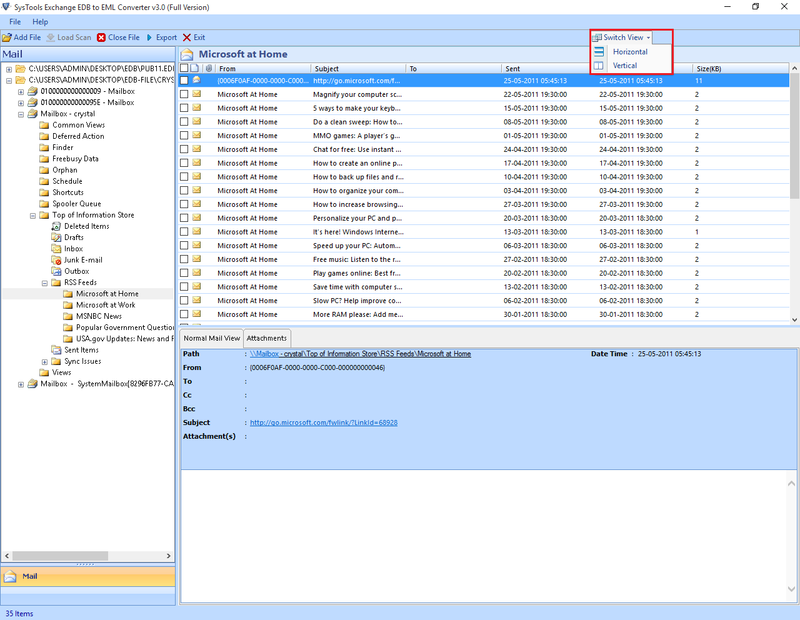 The Maintain hierarchical Folder Structure feature allows users to preserve the folder structure same as the source file structure. This will allow users to easily locate the files & provides better GUI interface for users. In order to extract data from corrupt Exchange EDB file, the software uses dual file scanning modes i.e. Quick scan and Advance scan. If the file is healthy then software will automatically perform the quick scan but if you will have a corrupt or damaged EDB file then go for the advance scanning mode to extract	data from it. This tool supports user to convert Exchange 2016 & 2013 EDB Files into EML File.You can Import Source EDB files for 5.5, 2000, 2003, 2007, 2010, 2013 & 2016. It also supports Windows 10 & below versions. EDB file should be offline or dismounted. May I know, How this tool works in converting EDB to EML format? In what time will I get software license after making purchase? Once you make the payment you will get a download link of the software full version on your registered email ID. This process takes a very less amount of time, approximately 5-10 minutes to get software license. Can this software work on a Windows 10 64-bit machine? Yes, software will work on a Windows 10 64-bit version machine and all below versions as it is fully compatible with all versions of Windows OS. Does the software perform bulk EDB files conversion? No, software will only convert one EDB file at a time. However, you will be able to convert multiple mailboxes from one EDB file into EML format at once. You can also select / deselect mailboxes for conversion according to your choice. Is it necessary to have Exchange Server installed on the machine to perform conversion? No, the conversion of EDB file into EML format can be done without installation of Exchange Server. 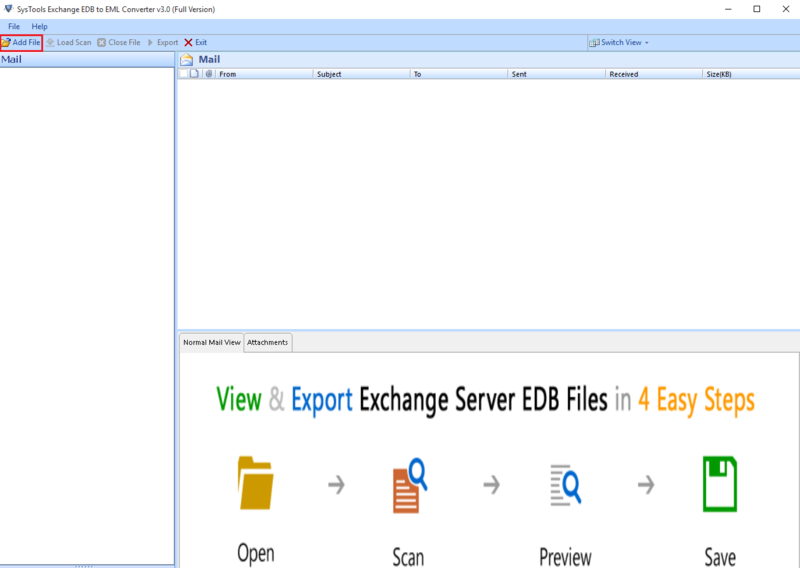 Please make sure that EDB file is properly dismounted from Exchange Server. Can a corrupt EDB file data be converted as healthy data in EML format? Yes, before conversion software scans the EDB file in order to remove corruption if it exists. To get rid of severe corruption issues you can select Advance Scan option and then convert the healthy data into EML format file. Is it possible to import converted EML file into supportive email clients? Yes, once you convert an EDB file into EML format you can import the output EML files into Outlook Express, Windows Live Mail, Thunderbird and other EML supportive email clients. Can I also convert emails from Deleted Items folder? Yes, software converts all data items of Exchange mailbox into EML format. If you have accidently deleted some emails from your Exchange mailbox then by using Advance Scan you can also deleted emails and convert them into EML format. Will I be able to get same folder structure after conversion? Yes, software retains same EDB file's folder hierarchy in EML format even after conversion. There is no chance for data loss involved in using this software. There is no such file size limitation. Software is built with advanced technologies and algorithms to process any size of EDB file and convert it into EML format without any issues confronted by the user. EML files were all that we wanted the only difference was no compromise was expected to be made with our Exchange database. 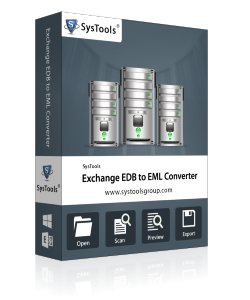 Hence, we planned to go with a third party tool and chose SysTools Exchange EDB to EML Converter and we are glad that we did! There were times when we had to come across the faulty applications while looking out for a genuine converter for EDB to EML conversion. Thanks to my client, Exchange EDB to EML Converter was introduced and we are grateful to the developers for creating this friendly and absolutely precise tool. Exchange EDB to EML converter helped me to convert my corrupted EDB database to EML format without causing any difficulties. I am very thankful to the developement team for providing such a flawless tool. The feature I liked about this tool is it's In-Built Search Feature. It helped me to search and find the EDB files within the local system.